From season to season, high-end bridal fashion shows always have patterns and trends. From smaller details to over-arching styles, there are always common elements that observers love to find. 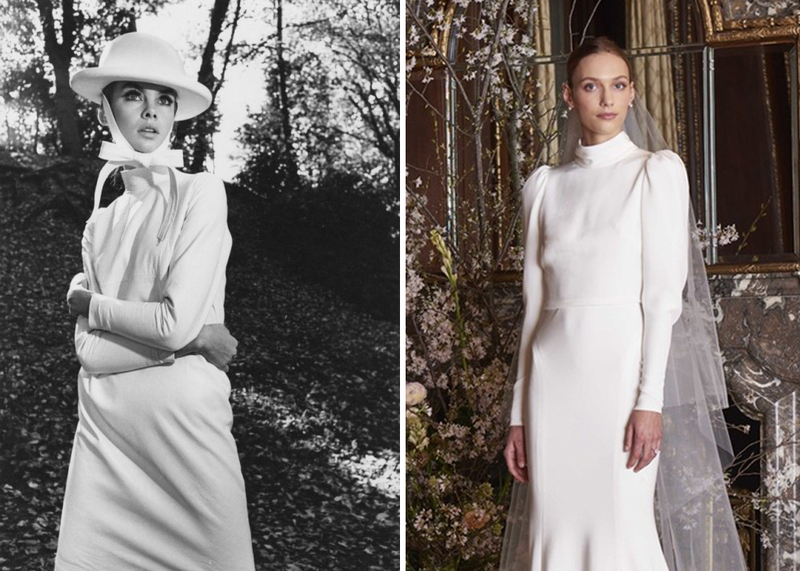 The 2019-2020 bridal fashion season has seen a number of similarities, from bows to jumpsuits to high necks to Meghan Markle-inspired everything. However, one trend that has been impossible to overlook is the rise of mod wedding dresses, pulling from the style sensation of the 1960s. This particular bridal trend is both unique and sweet, featuring touches from the past that are still striking. 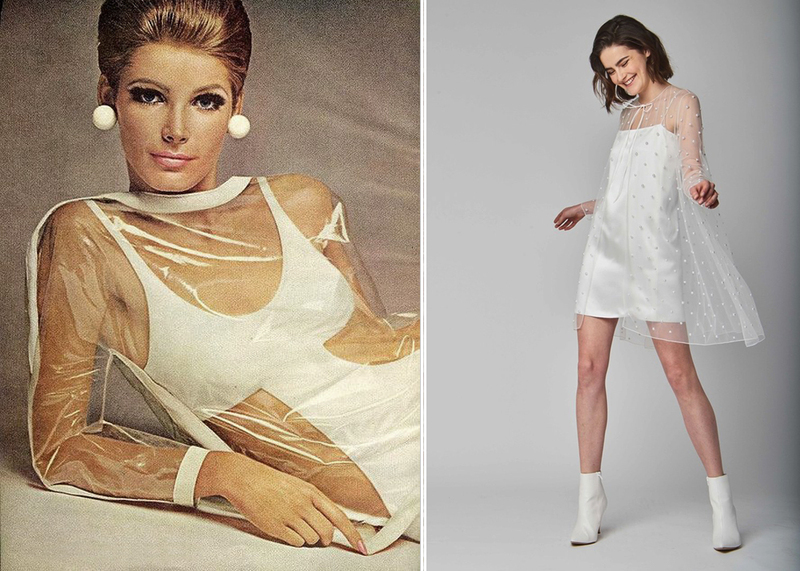 The mod craze was a massive part of the 1960s, and for a while was the ultimate in high fashion—which is why it’s no surprise that shades of it still appear in couture today. 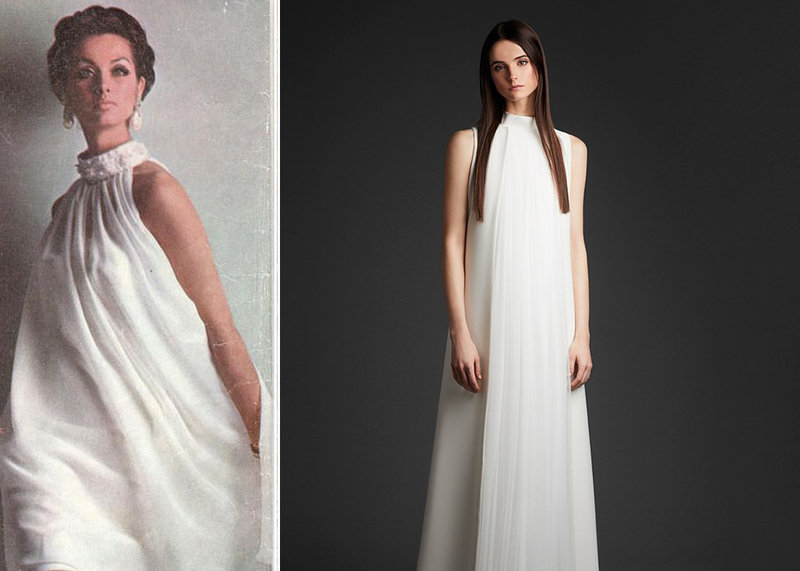 You can see that this elegant design from the Monique Lhuillier Spring 2019 Collection is a near replica of this lovely mod creation circa 1964, but has added its own modern touches. Short, boxy mini dresses were a staple of mod fashion. Sophie et Voilà’s recent design on the left echoes this style with its short hem, bare arms, and high neck. Perfect for a casual wedding ceremony, elopement, or reception dress, this couture creation is nothing short of mod-tastic. 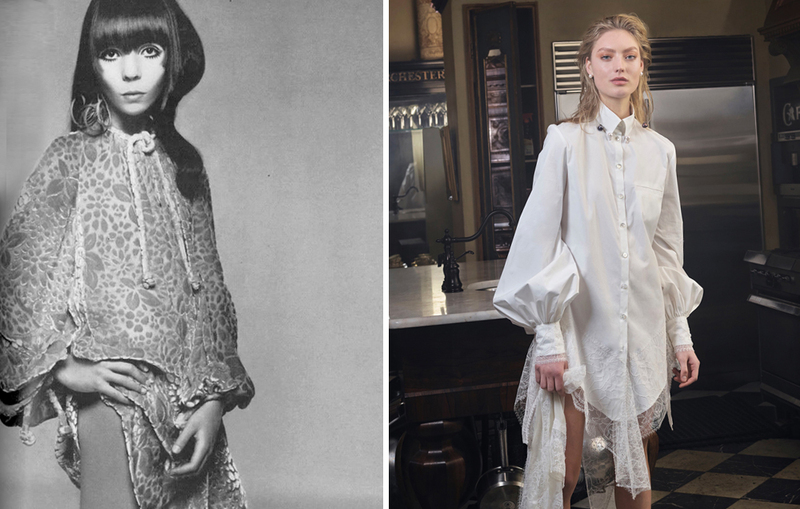 Further into the mod revolution, the style began to incorporate other 1960s fashions that were becoming popular—such as Edwardian hippie looks. Mod was still mod, but now other elements were being incorporated, such as long puffed sleeves (as seen above) and button-ups. The dress above from Danielle Frankel’s Bridal Spring 2019 New York Collection would have fit in perfectly in the mid-1960s, and makes a chic choice for bridal events, a casual wedding, or the second reception dress. 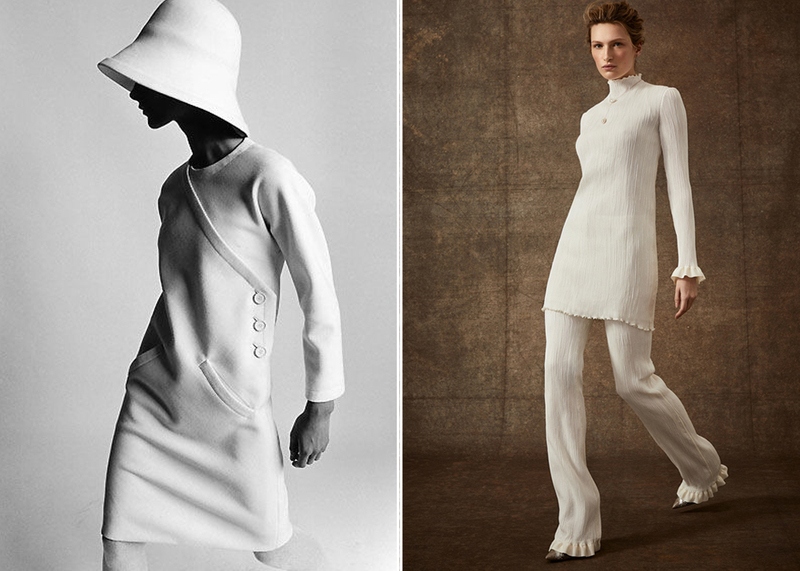 For the most part, 1960s mod dresses were short—micro-minis, in fact. However, there were mod maxi dresses out there, and nothing replicates this style more beautifully than this Viktor & Rolf floor-length gown from the Bridal Spring/Summer 2019 Mariage Collection. Embellished with very 1960s-style florals, this stunning bridal dress just radiates with a mod edge. 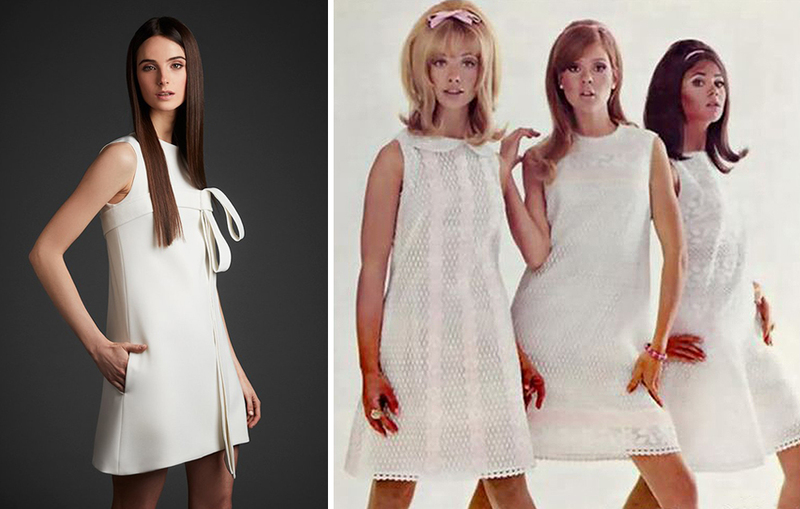 The mod style gave women a very pure, angelic look. This is something that many brides want to have, and it’s easy with the ushering in of mod wedding dresses this season. The gorgeous design above by Viktor & Rolf from their Bridal Spring/Summer 2019 Mariage Collection is a perfect example. Its high neck and angled shape is extremely haute, and couldn’t be more mod. The floral embellishment also radiates the 1960s, and makes the ideal choice for brides who are looking for a mod wedding dress. Another look straight out of the 1960s, this Danielle Frankel Spring 2020 design calls to mind the silhouettes and vibe of the mod world. Bridal two-piece ensembles such as this are one of the biggest bridal trend this season, and with good reason: many brides are choosing to trade traditional gowns in for a more modern, of-the-time look. This design would also be ideal for the reception. Mod fashion paved the way for its sub-style, space age fashion, which was like the wild younger sister of mod. Space age featured lots of plastic, cut-outs, and see-through material. The design above from Alexandra Grecco’s Spring 2019 bridal collection echoes mod/space age fashion beautifully by combining the factors of a see-through cape, a mini-hem, and go-go boots. Another perfect dress for a low-key ceremony or for dancing at the reception. 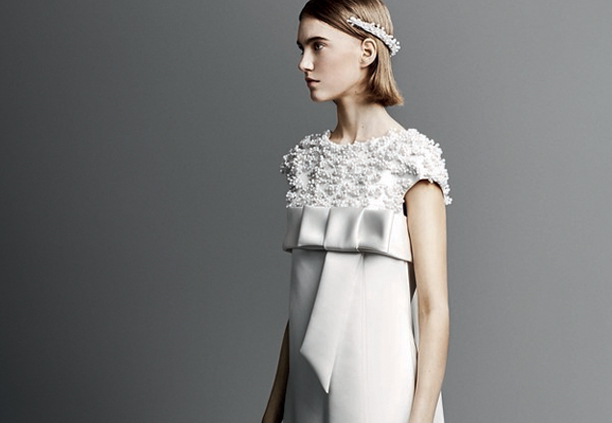 “Mod wedding dresses” can mean many things. 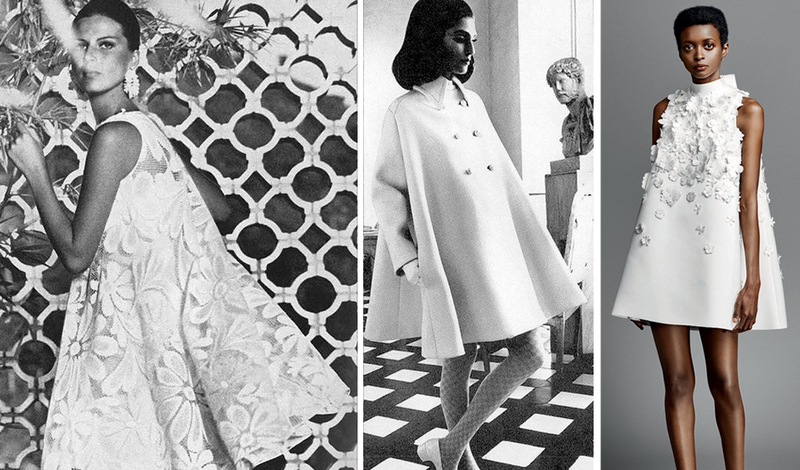 The 1960s style featured all sorts of details that are considered “mod”, from geometrical shapes to bows to high hems. Each of these details can be added to a more modern look, which can automatically make that design feel “mod”. 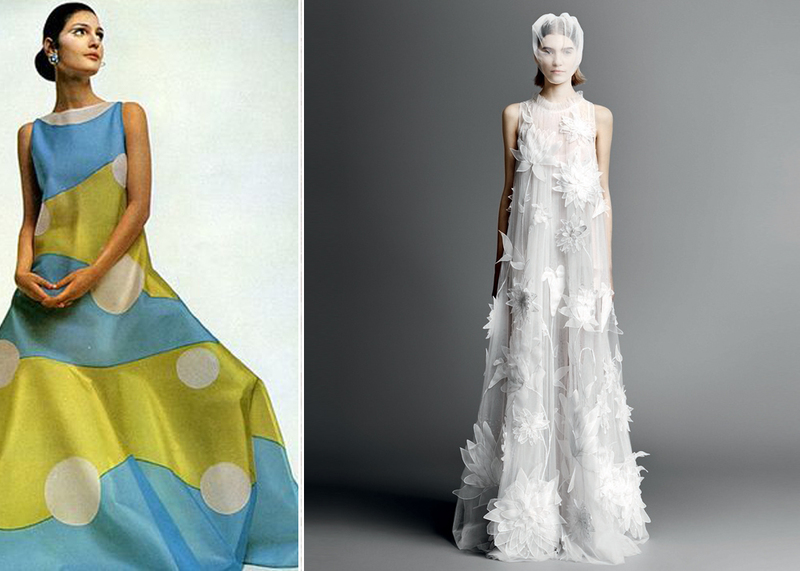 In the examples above, the Viktor & Rolf wedding dress (middle) feels very “mod” due to its large bow and its embellished top, very much like the 1960s photo comparison. And the Rita Vinieris suit from the Spring 2019 Collection (far right) echoes the wide tailoring and lace. Although it may feel subconscious, these mod elements being added to modern styles is noticeable. The mod style was much about simplicity, as evidenced by the vintage image above. Elegance and sophistication were never sacrificed, but only enhanced with the paired-down designs of the 1960s mod styles. A great example of this is the absolutely gorgeous wedding dress above from Sophie et Voilà. Its high neck, mod triangular shape, and bare arms recall the chic vibe of the swinging London in the 1960s. Shirt-dresses like the one Twiggy is wearing above were a major part of the mod style in the 1960s, and as you can see, this style still works fantastically. The Viktor & Rolf dress above from the bridal Fall/Winter 2019 Mariage Collection would be right at home in the pages of any Vogue from the mid 1960s, and makes another lovely choice for brides who are looking for something casual or are searching for their ideal reception dress.